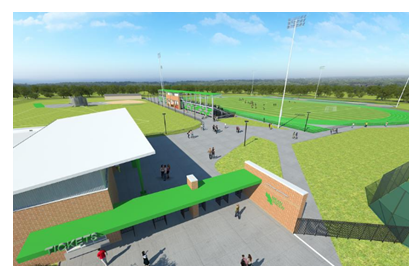 ​​​​ DENTON – Construction has started on a new soccer and track and field stadium at The University of North Texas (UNT)—which will give Mean Green athletes an upgraded platform for competition. The $13.6 million facility will include a sand-based soccer field, an eight-lane track and enough seating for 1,500 fans. The facility is expected to give UNT the opportunity to host Conference USA championships, among other events. This will be the first major construction project at Mean Green Village under the leadership of Wren Baker, UNT's vice president of intercollegiate athletics and director of athletics. Since 1952, the college's track and field teams have called Fouts Field home. Meanwhile, the UNT soccer team has played at Mean Green Soccer Stadium since 2006. ​Check o​ut more education stories across Texas.